This is Mark Twain Middle School’s fourth year of being on the Mar Vista Green Garden Showcase. This year, in addition, it's on the Wildside School Garden Tour. Five garden/educator volunteers work with the teachers at Mark Twain Middle to incorporate the garden into their academic subjects. In addition to the classes taught during school hours, over 30 enthusiastic, committed students come out each day to work and play in the garden during nutrition break and lunchtime. They've built a grape arbor and outdoor theater in the garden with volunteers. The students have sold kale, chard, peas, lettuce, herbs, and bok choy from their Garden at the Mar Vista Farmers' Market. Mark Twain Middle School is participating in the LA Wheat Project, a pilot designed to encourage local students to learn about planting, growing, and harvesting wheat--and the process of making whole-grain bread (from seed to loaf!). Master Gardener Dana Morgan will be at the garden from 10:00 a.m - 12:30 p.m. to answer your questions about the program, how it can be incorporated into the curriculum, and about wheat planting, cultivation, harvesting, seed storage, milling, and so forth. 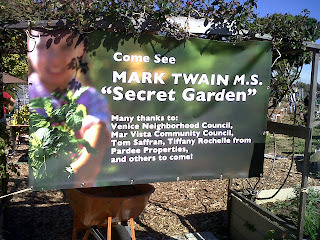 The Mark Twain garden is a wonderful example of what other schools and children’s programs can do to link children with nature & sustainable living. The garden is also on the Wildside School Garden Tour. Learn a little about the history of the area here.